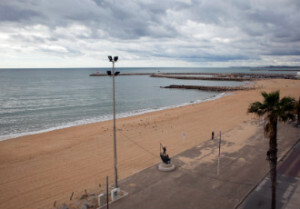 The white beaches and tax exemptions offered by Quarteira are among the main factors that attract retirees from other European countries to Portugal. The waiting staff bring out additional tables as more and more people turn out for a lunch meeting of the Finnish Society in Algarve, southern Portugal. Raimo Luokomaa, the chairperson of the society and a long-time resident of Portugal, is surprised by the recent popularity of the monthly meetings. “One-third of them are people I don’t know,” he estimates as roughly one hundred retirees sit side-by-side around the tables of a restaurant in the town of Quarteira. Most members of the nearly 25-year-old Finnish Society in Algarve are retirees living in the temperate coastal region of Portugal. The number of members has increased by more than a couple of hundred over the past year. In fact, so many have contacted the society by e-mail to enquire about moving to and living in the south-westernmost country of Europe that the society has been unable to reply to the enquiries in time, reveals Maija Katila, the executive director at the Finnish Society in Algarve. “We weren’t prepared for such a sudden flood of e-mails. The enquiries began to increase last autumn and still continue to do so,” she tells. Katila is responsible for organising activities and managing the contact network of the society. Known for its sunshine, long beaches and low cost of living, Portugal has attracted elderly people from European countries with higher rainfall and cooler weather for decades. Recently, however, retirees have been drawn to the country also by the possibility of enjoying their pensions tax free. Portugal has sought to attract new residents by granting retirees who move to the country permanently a ten-year exemption from taxes on their pension income under certain conditions. The country has vested its faith in the purchasing power of retirees as it seeks to patch up its fiscal deficit and cope with the lingering debt crisis. The retirees are expected to buy cars and real estate as well as boost the cash flows of local shops and restaurants to the extent that they will benefit the local economy despite their tax-free status. “I’ve received tens if not hundreds of phone calls not only from Finland but also from Finns living in Morocco, Turkey and Spain. We’ve also had to provide services to holiday-makers who’re considering retiring here for tax reasons,” lists Luokomaa. The Finnish Society in Algarve refuses to officially comment on the tax exemption scheme. Several retirees who have moved to Portugal recently have showed up for the lunch meeting. They are in high spirits: speeches are made, songs are sung and toasts are made. Luokomaa assures the newer members of the Finnish community that they will make new friends soon and that no one will be left alone. Finns began to migrate to the resorts of Portimão and Quarteira in Algarve in the 1980s as a result of the winter package tours offered by Finnmatkat, says Katila. “Despite the current high number of enquiries, only few are eventually able to move here,” she reminds. The chatter from the tables picks up as the waiting staff bring out the dessert puddings and as people who have moved to the region recently try to get to know those who are already familiar with it. Few, however, dare to discuss their decision to emigrate from Finland in public. “Definitely not. We’ve got so many jealous neighbors in Finland,” says one woman. The reluctance of the emigrants stems from the public outrage that emerged in Finland after Maarit Toivanen-Koivisto, a major shareholder in Onvest, announced in an interview with Helsingin Sanomat late last year that she and her family will move to Portugal in order to avoid inheritance tax. The outrage ultimately heated up to the extent that Antti Rinne (SDP), the Minister of Finance, branded the tax exemption scheme introduced by Portugal as a flaw that must be corrected in an interview with Iltalehti. Finland has consequently launched negotiations with Lisbon over a new bilateral tax agreement. Timo, one of the retirees in Quarteira who decline to comment on the matter with their full name, estimates that the actions of Rinne are due to the looming parliamentary elections. He points out that Finnish retirees in Portugal have also before been generally exempt from taxes in Finland, but now the “mill of the jealous” is being fueled by reports about the tax scheme. “How does the fact that a marginal group of senior citizens move here harm Finland? They will in any case pay 1.5 per cent in health care tax to Finland, although they don’t use the roads, streets or health care system,” he argues. “The Ministry of Finance should focus on the major companies that file their taxes abroad,” he says.